Icebreakers are important component of any new group. Think about it, you bring a group of individuals together and expect them to work on a common goal and share their thoughts and opinions with others they may or may not know, or worse, may or may not like. Games are a great way to encourage students to participate while also providing a safe opportunity to share information about themselves and start to form bonds with the other people in group with them. Since my Lunch Bunches are are open to anyone, I can get many students who often begin group not knowing or liking the other members. Never fear, however, with good guidance and a little patience, students can end the year with some new best friends. I am so excited that my LB groups have begun. I love talking about friendship and kindness, and I am excited to see where this year will take us. I love hearing all the kids' ideas and then seeing them come to fruition. I wanted to start this year with something a little different than last year. 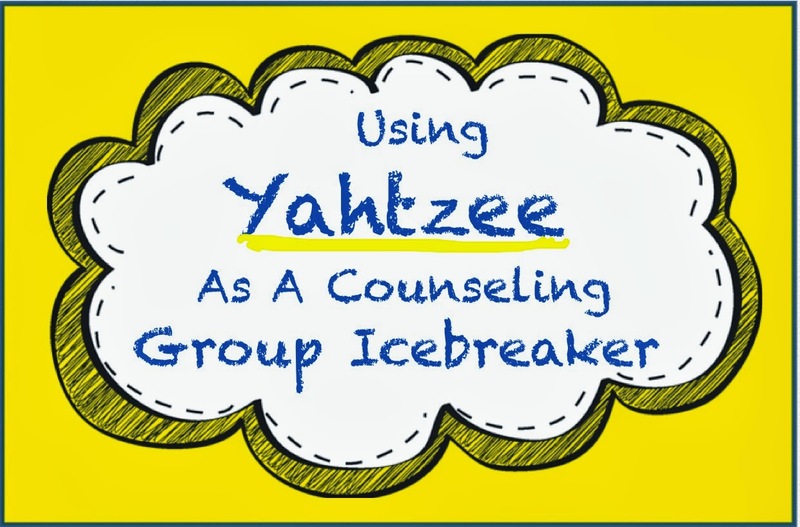 I have read online how other counselors use everyday games in therapy and decided that I would use a game as an icebreaker with my groups. I chose Yahtzee because it is my favorite game, and then made my own score sheet (click on the picture to open google docs and download). The basic categories are the same, except I omitted 4 of a Kind because I couldn't get it to fit on one page (not to mention I can never get 4 of a Kind anyway). Don't look too carefully, because I also had to make my own dice on the score sheet because I couldn't find pictures of ones online. If you look carefully you will see that my dots are not even and aligned, but I still think it looks pretty good anyway! My 5th and 6th grade Lunch Bunches were huge, each having more than 14 students. I had four sets of dice going at once, having the students playing take their 3 rolls, choose their category and then pause until all 4 students had caught up. They then shared their answer with the larger group and passed the dice. Although we couldn't finish an entire game, each student had multiple chances to roll and shared a lot o info about themselves. All in all, they had fun. I even had a request to play again this week. I'm a K-6 counselor and have found that Connect 4 is a great game for practicing sharing/taking turns/compromising/working together. I put 2 students on one side (as a team) to play against me. This has worked especially well for students who struggle to get along. Because they have a common goal (trying to get 4 in a row before I do), they are able to apply those social skills on a small task. They can then apply them to situations outside of the counseling office like the playground, etc. Can I get a copy of this emailed to me as well (erinemartin417@gmail.com)? Thanks! I would also love a copy since the link doesn't work. Thank you for the great idea! 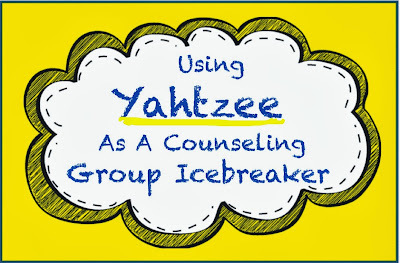 Please send me the Yahtzee link at mkiernan@wareham.k12.ma.us. Thank you. Please send me a copy as well. When I click on the link it takes me to the image instead of Google Docs. Thank you for sharing!! I would love a copy emailed to jennifera@lcalions.com. I cannot access the google doc. Can I get a copy of this sent to qtrefsgar@gmail.com? Thanks! !